I’m writing this week from a place not many would associate with exciting destinations for adventure travel: Greater Los Angeles. My family and I are here to share Thanksgiving with relatives and see a few sights. But even the most mundane travels need not be without an infusion of adventure, I long ago discovered. I’m convinced that adventure travel can happen with little else but a mindset and a few unconventional choices. While much of the L.A. basin is on the surface a homogenous grid of strip malls and chain stores and auto dealerships and tract-home neighborhoods overlaid by a maze of 12-lane freeways and looping interchanges, there is much to engage with that is worlds away from what we’re used to at home in our sheltered enclave of Boulder, Colorado, especially for my kids, who are 16 and 12. My politically minded son, who has a deep social consciousness and is fascinated with hip-hop culture, wanted to see real graffiti in the neighborhoods where rap music originates. 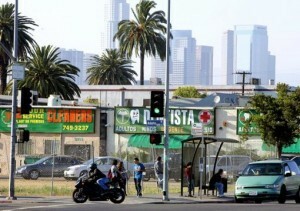 So we took a drive through Compton, Watts and up Avalon Boulevard through the heart of South Central. We did see plenty of impressive wall murals – “the people’s art,” my son says. We also saw gang tags, mobile taco trailers, razor wire atop chain-link fences protecting pawn shops and used car lots, Mexican grocery stores, Missionary Baptist churches, dilapidated schools, kids’ soccer games and pick-up basketball on concrete courts, crowded bus stops and, on the side streets, rows and rows of little bungalows, many with neat green lawns and flower pots and, always, bars over all the windows. Our rented Chrysler was the newest car for blocks, and we felt like our white faces were very conspicuous. But we weren’t trying to gawk so much as absorb, contemplate and understand. Elsewhere, as we drove from Orange County into the heart of downtown L.A., we found pho in Little Saigon and pupusas along Pico Boulevard west of the Staples Center, noting that just because the signs are in Spanish, it doesn’t mean it’s a Mexican community – this was clearly Little El Salvador, for a few blocks, anyway. 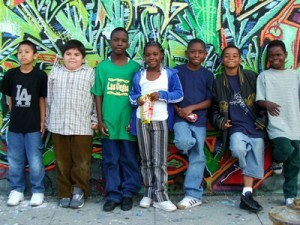 Kids in South Central L.A. Within our brief venture into lesser-known territory, we found adventure in discovery, in a slight sense of risk (most of my mom-friends wouldn’t dream of driving by themselves with their kids through Gangland), and a brush with cultures in contrast with our own. Yet we also saw mothers pushing strollers, children playing, people shopping, old men with weathered brown faces and white straw cowboy hats chatting on a sidewalk — the universal amidst the unfamiliar, another theme unveiled by travel. In our case, our outing was decidedly outside our typical routine — or a typical tourist routine in L.A. I’m sure we’ll still wind along Mulholland Drive and ogle the Hollywood sign and gape at Rodeo Drive and stroll to the end of Santa Monica pier, but I suspect the stronger impression will be left by yesterday’s experience, in which adventure had a greater quotient. While my own yearning for adventure includes a bucket list of out-there experiences like trekking around Mt. Kailash in Tibet or rafting the Tatshenshini River in Alaska or kayaking in Vietnam’s Halong Bay and the high Arctic, I am enlivened when I seek it out within my day–to-day life, too. How about you? Where do you find adventure? We’d love for you, our readers, to join the conversation. Please comment below!